We’re in Canada at the moment, visiting family and friends for the holiday season. Knowing I’d have little time to blog, I banked a few recipes that I could share on the go. 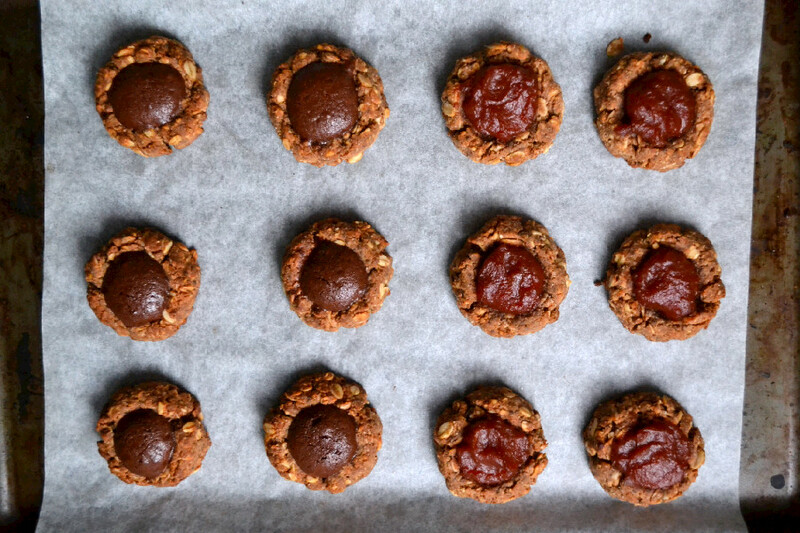 If you’re not all cookied out yet and looking for something to nibble that’s not as indulgent and on the healthier side of things, here’s my thumbprint recipe. It’s made with whole grains and gets most of its sweetness from the filling, as the base itself is only slightly sweetened with brown rice syrup. I’ve used my homemade apple butter and some homemade chocolate hazelnut spread to fill these but you could use any jam, jelly or marmalade of your choosing. Homemade Chocolate Hazelnut Spread (“nutella”) – mix the following ingredients to get a spreadable cream. Preheat oven to 180 C and line a cookie sheet with parchment paper. Add hazelnut butter, brown rice syrup, and coconut oil and mix together. Add water slowly, as needed, to create a compact ball of dough that is neither too wet and sticky, nor too dry. You want it to hold together enough to form the cookies. Divide into 12 parts and form little balls of cookie dough. Use your thumb or the back of around measuring teaspoon to create a dent or thumbprint in the centre of each dough ball. Spoon your choice of filling into the dent and bake for about 20 minutes.